First of all, I am really flattered since an artist like Ioannis has sent out to me his CD for a review in my blog. For those who don’t know Ioannis, he’s a true virtuoso flamenco guitar player and his extraordinary abilities are clearly showcased in the already classic “Flamenco Live At Ioannina” CD which was released in 2001. Being a student of one of the greatest flamenco maestros, Juan Serrano, Ioannis’ talent could not stay hidden and soon the world and of course Greece discovered a true master of the six-string. At the same time, something that is also revealed in The “Flamenco Live..”, Ioannis couldn’t not hide his great passion for Metal music and he mentioned in his thanks list the numerous virtuosos of the genre such as Yngwie J. Malmsteen, Vinnie Moore, Michael Romeo, etc.! His brand new CD “Suspension Of Disbelief” reflects also the “electric” side of him, since this time, only 3 tracks of out a total of 11 (“Variations Of Malaguena”, “Dos Hermanos (Bulerias)”, “Flamenco Journal – At A glance”) are flamenco-oriented. I am definitely not a flamenco–expert but I cannot hold myself from showing my admiration to the passionate Spanish sound of Ioannis guitar! A demanding style like flamenco can only performed fluently by great maestros and definitely Ioannis is a member of the pack! The “electric” side of Ioannis is simply surprising. The opening self-titled track of the CD mixes various styles such as jazzy/fusion and a little funk elements with melodic harmonies as Ioannis comments also in the booklet. A truly enjoyable track, but the second track of the CD left me speechless! “Caravan Of Despair Suite” is an 11 minute and 13 second long masterpiece, an unrepeatable anthem in modern instrumental Metal music! Full of passionate and Phrygian-inspired moments, with the female vocal melodies giving a mysterious tone from the very beginning, the song is a great example of how Neo-classical Metal should be sound! Imagine that Ioannis dedicated this state-of-the-art song to Yngwie J. Malmsteen, when at the same time other so-called “geniuses” guitarists have always fear in mentioning his name (another bright example such as Ioannis is the always amazing Michael Romeo!)! I could comment a song like “Caravan...” for days but simply, there are no words to give a comprehensive description of its greatness! Another wonderful, catchy and worthy to mention instrumental tracks is “The Forgotten Quest”, with a “sweet” main melody that easily becomes familiar to your ear. This could easily become a vocal song also! Along with the above mentioned songs, I must also highlight “The Final Jam”, a “guitar battle” featuring bright hopes and already established guitar players that Ioannis gathered especially for this song. Alex Flouros, Lakis Regazas, 15-year-old George Emmanouel, Marcel Coenen, Theodore Ziras, Constantine, Bob Katsionis and of course Ioannis contribute their solo performances and once again the result is splendid! 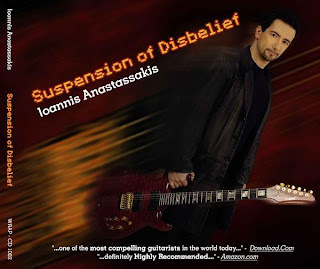 “Suspension Of Disbelief” is an album not only destined for instrumental music aficionados but also for every listener that enjoys music as an art form! Visit Ioannis’ mySpace profile: http://www.myspace.com/ioannisanastassakis and don’t forget to check also his web-site (http://www.ioannis.org/) if you want further details for his teaching courses and also his instructional releases. P.S. : I must also not forget to mention the highly detailed booklet that accompanies the CD and it features songs comments, bio info and an interview of Ioannis. This is how well-cared releases should be done!